Labor Day weekend is almost over:( Allen and I did have fun though. We grilled chicken kabobs last night and went to Macaroni Grill Saturday night. Food was excellent both nights. We also bought a recumbent bike. We debated between that and a treadmill. The significant price differance and Allen’s impending surgery helped make the answer. The bike will be less impact than a treadmill. Hopefully later tonight we will put the bike together (probably after we finish The Good, the Bad and the Ugly). 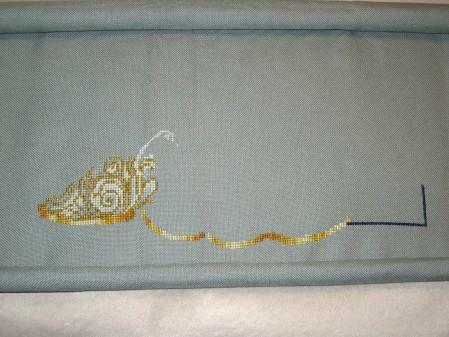 I also got a whole lot of stitching done this weekend. I worked for then hours on CW and it is looking fantastic. I almost completely finished the train of her dress. There is only one color missing from that area. Now it is time to move on to Olde World Map. 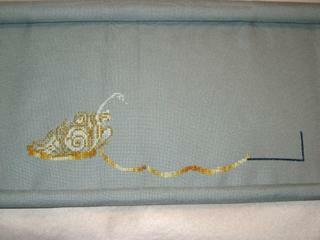 Hopefully I can get in at least and hour of stitching on it tonight. Oooo, she is looking great!! !